December 13th will mark the 29th anniversary of the release of Martha’s first book, Entertaining. 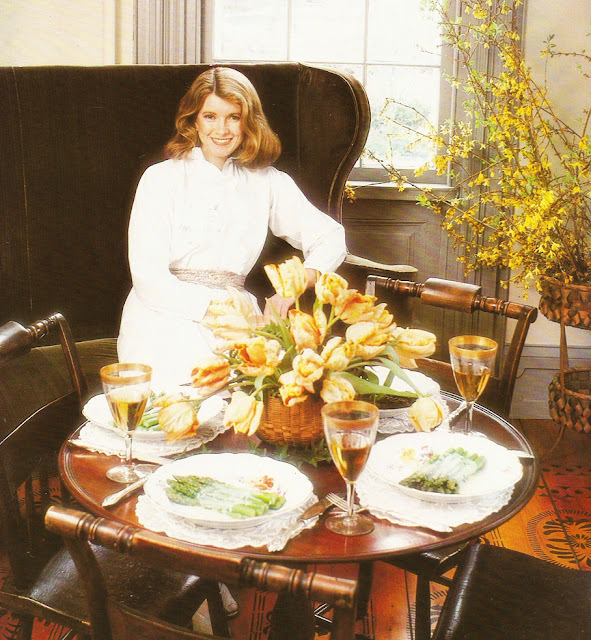 With the recent arrival of her new book, Martha’s Entertaining A Year of Celebrations, I thought it would be nice to look back at the classic book that launched Martha’s career in 1982 and set a new standard in the art of hosting. Not a review, exactly, because we all know it’s fantastic, but more of a retrospective. I will start by saying that I am not really the entertaining type. This admission will hopefully put my love of this book into context. I love my friends and I adore my family, but historically we have always gone out to celebrate various milestones, drawn to one fabulous restaurant or another. In Toronto, there are so many to choose from! Growing up, our family entertained a lot and we spent a lot of time at the homes of relatives and friends who had a true flare for entertaining, which revealed itself in the wonderful home-cooked food and the spirited laughter that came with the storytelling and reminiscing. Over the years, I have been exposed to all sorts of wonderful flavours and beautiful table settings through entertaining, evenings that were graciously conjured by the host or hostess with love and generosity. My exposure to entertaing would explain my interest in it and my rather large assortment of books on cooking, entertaining and flower arranging. Perhaps for me it is nostalgia that draws me to these books, again and again. But I’m sure one day, when I have more space and more time, I will entertain more frequently. Martha in the parlour at Turkey Hill, 1981. When that time comes, I will certainly be turning to Martha’s first book for ideas and inspiration. Because I am so interested in Martha’s career and the history of her company’s development, I have read Entertaining from cover to cover, even many of the recipes. I have not actually made any of the recipes, but below you will find my top-ten from this book; these are recipes that I have written out onto cards and put into my recipe box for future use. After living with the book for over a decade, I can tell you that Entertaining is one of my most treasured volumes. I have the first edition, naturally, and since I bought it used I am fond of its somewhat dogeared pages and crinkled spine. Someone clearly enjoyed it before I did and I admire its well-loved condition. Looking through the book is always a happy experience for me. 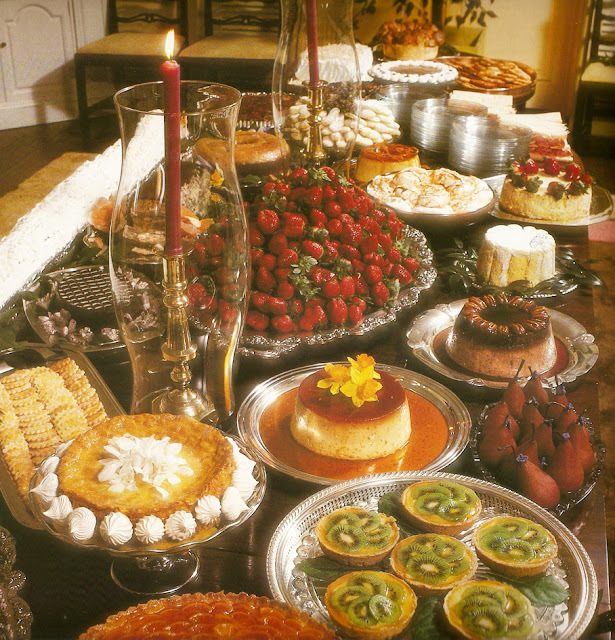 Wrapped up in the imagery on the pages and the finesse in Martha’s prose (text with Elizabeth Hawes) are my own memories of holiday gatherings, anniversary dinners, birthday parties and impromptu gatherings with my grandparents or my aunts and uncles, most of whom are exceptional cooks. I remember the various kitchens that made impressions on me, just as Martha remembers those that impressed her as a child. And I remember the flavours, the beautiful china, the flowers on the table and the warmth of candlelight as we spent time together, celebrating and enjoying ourselves. So, as I read, I remember. 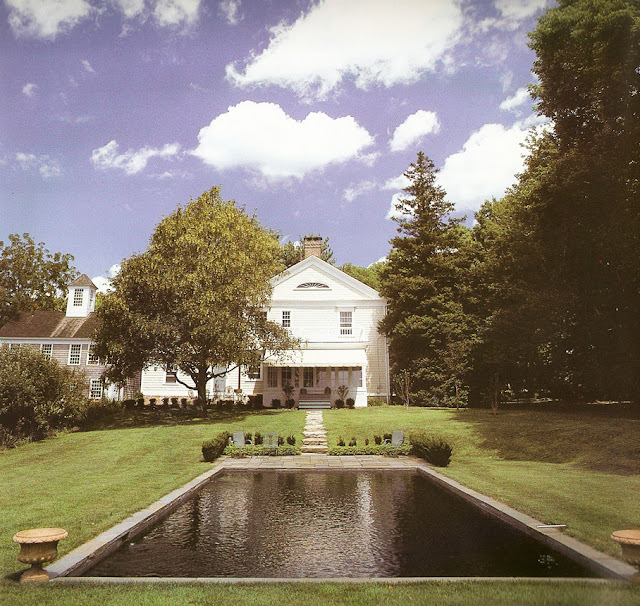 The side yard at Turkey Hill as it appeared in the late 1970s, long before the pool area was landscaped. Martha and Andy painted the sides and floor of the pool black to give it the effect of a pond. Using a quilt as a tablecloth adds to the rustic charm of this setting. 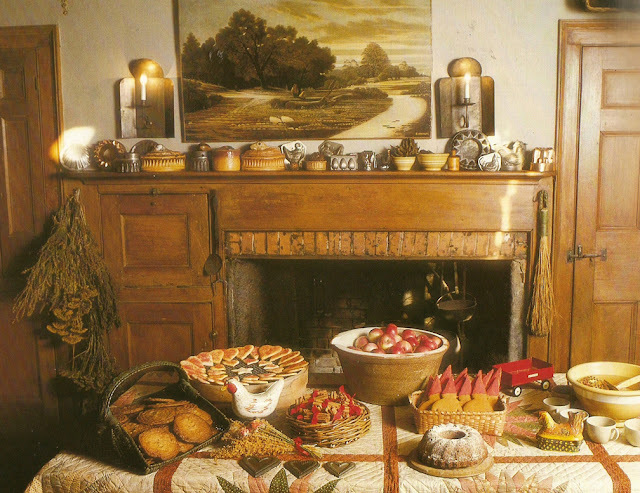 Martha's mantel is laden with various kitchen collectibles, some of which were used in the photography in her current book, Martha's Entertaining, such as the French porcelain paté and terrine molds by Pillivuyt from the 1800s. 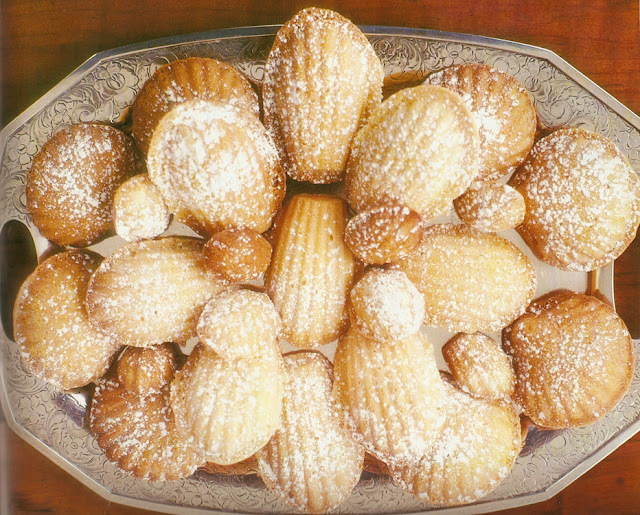 The ones shown here appear on page 76 in her new book on entertaining. This quote is endearing because it unveils Martha’s unbridled imagination and curiosity – two traits that have led to her continued success and that speak to her passion. The quote is important because of the understanding that the inspiration for an evening with friends and family can come from anywhere – even history books and classical literature! 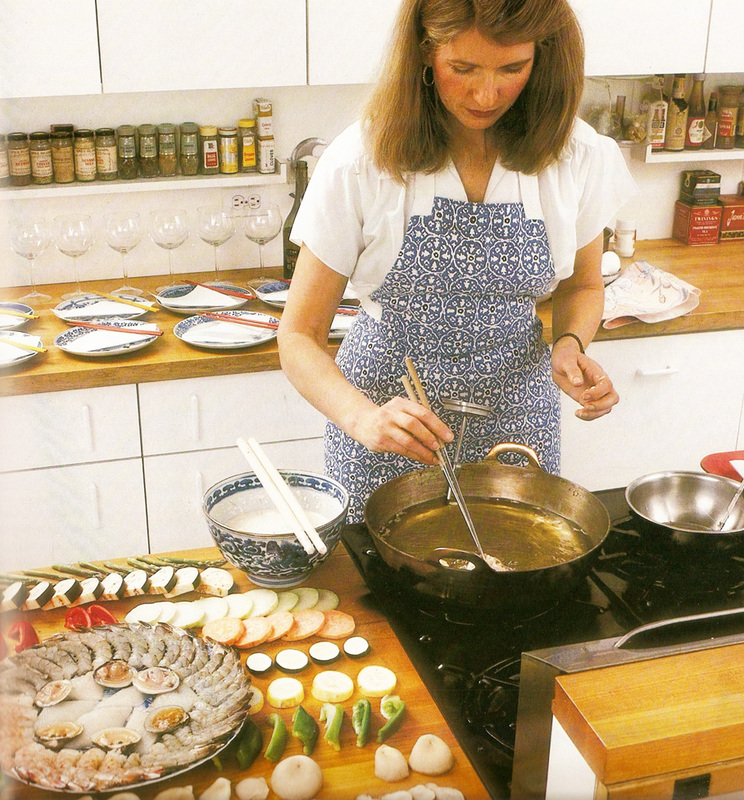 In the introduction, Martha specifies the three kitchens that most made an impression on her when she was growing up. Obviously, her mother’s kitchen leads the list. Martha describes it as a large, 1930's eat-in kitchen in suburban New Jersey. She writes: “It was a way-station between the outside and the inside world, between garden and table.” A perfect summary of how so many kitchens from that era functioned. She also describes the professional kitchens of her Uncle Joe (who was a butcher) and her Uncle Metzu, who owned a Polish delicatessen in town. The efficiency and commercial potential of these kitchens, too, were no doubt influential to Martha. Her maternal grandmother’s kitchen near Buffalo, New York, where Martha spent many of her summers, was the second kitchen of influence with its ice-box, huge cast-iron stove and the ever-ready canning pot that sat atop its surface. And the third kitchen was that of her family’s neighbors: Mr. And Mrs. Maus, retired German bakers who continued to bake from home. Between the ages of 4 and 10 Martha would scurry next door with her siblings to help them make their famous breads, cakes, kuchen and strudels. She describes her role as half apprentice/half taster! So much of what makes Entertaining so enjoyable to read rests in the settings depicted in the book’s imagery. Turkey Hill – Martha’s former home in Connecticut – is the book’s pictorial bedrock. With its simple farmhouse layout and expansive gardens, Martha uses the home itself as inspiration for her menus and events, and urges her readers to stroll through their own homes and backyards to gather inspiration. Turkey Hill, as it appears in Entertaining, is a perfect glimpse into the burgeoning culture of home in the 1980's: warm, inviting, a refuge from the pressures of city life. In a decade so defined by its razor-edged, neon harshness, home began to emerge as a new frontier of comfort and bliss, a place you could control and beautify. Through Entertaining, Martha unwittingly led the charge with her depictions of pastoral country life, extolling the virtues of growing your own vegetables and raising your own hens at a time when women were heading in droves to the gates of ever-expanding corporations. She was, in a sense, part of the counter-culture (pun intended) yet was able to become a brand, herself, in the process. 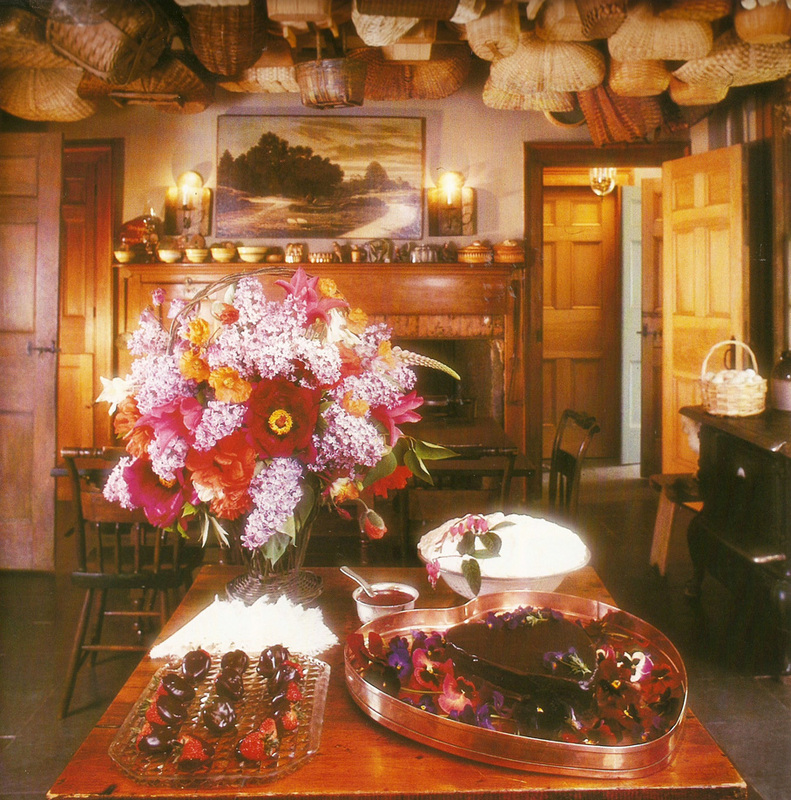 A warm and cozy corner in Martha's kitchen at Turkey Hill in Westport, Connecticut, in the early 1980s. I love how this kitchen looks. As Martha notes, it is expressive. It is clearly a place that is used to bustle and activity and everything is always at the ready, from the tools to the produce to the pilot light. It reminds me, actually, of an artist’s studio with paint splashes on the floor, blank canvases stacked waiting to be ignited by the touch of a brush and sketches and ideas brimming in every corner. Martha’s kitchen is vital, her passion evident in every detail. A glorious display of desserts arranged on a table in the parlour at Turkey Hill. I’m sure I will continue, now and then, to write about this book. It has so much to offer an observant mind like my own. It imparts so much knowledge to its readers, not least its profusion of recipes and advice on entertaining at home. More than this, however, it is a wonderful archive of Martha’s beginnings, destined to become historically significant for its cultural aperture on house and home, women’s studies and entrepreneurship. Tempura: Martha’s recipe was derived from tempura she tasted in Akasaka, Japan, made for her by chef Ten Masa. Her tempura party menu is simple, straightforward and delicious. I’m intrigued by its mix of flavours as much as its elegant simplicity. And I love tempura! French Mushroom Soup, Tuscan Tomato Soup and Iced Borscht: Martha’s chapter on soups is wonderfully written. It divides the recipes into Winter and Summer offerings, hot and cold soups that, again, are simple to make. I grew up with all kinds of homemade soups, so this chapter encourages me to continue some family traditions. Classic Eggnog: I once tried homemade eggnog and since then that drab stuff that comes out of the carton just doesn’t measure up. I’m definitely going to try Martha’s recipe this holiday season! Antipasto: My aunt Elena is Italian and she once made an incredible antipasto spread for a Christmas Eve party she hosted. I remember it was the platter I returned to most often that night. The gathering of fine, rustic ingredients (cured meats, pickles and breads) is such an easy and attractive option. Martha’s list of ingredients and her how-to makes it all the more accesible. 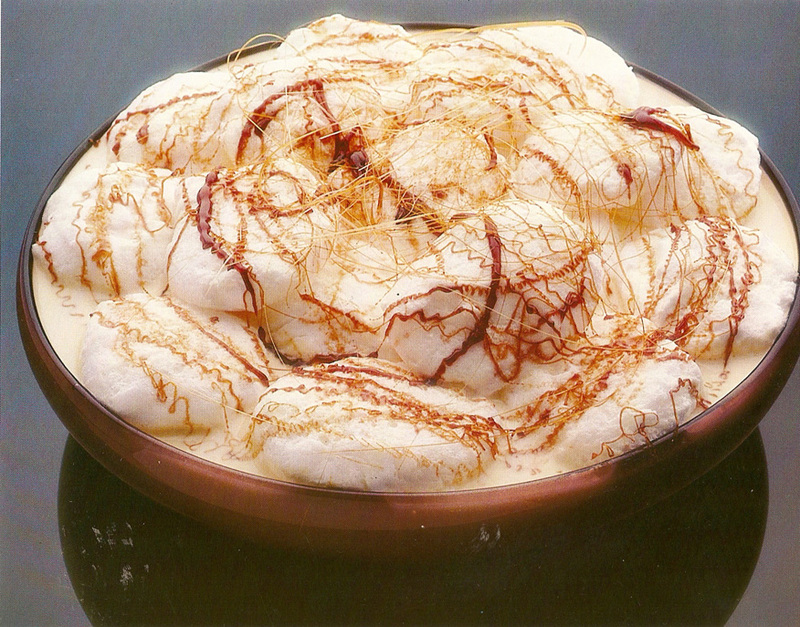 Oeufs a la Neige: I’m not sure I’m going to actually make this dessert, but reading through the ingredients and seeing an image of the final product certainly makes me want to try it sometime! Madeleines: My grandmother used to make Madeleines and they were my favourite with tea. I have her Madeleine pan, but not her recipe. Martha’s look similar and I love how she arranges them on the platter. I still turn to this edition...well worn, valuable information. Just discovered you recently. Your posts are so well written! I sense a kind soul behind those words. I enjoy following Martha with you as commentator. I have been in awe of her since the very beginning! Martha Stewart is a strong independent woman who never gave up on her ideals! That's why I respect her so much! I still read this book once in a while. I'm so glad I kept it. It's a dated book, but endearing and you can see how it was a breakthrough publication. I bought a first edition copy in excellent condiiton at the libray for $5.00. 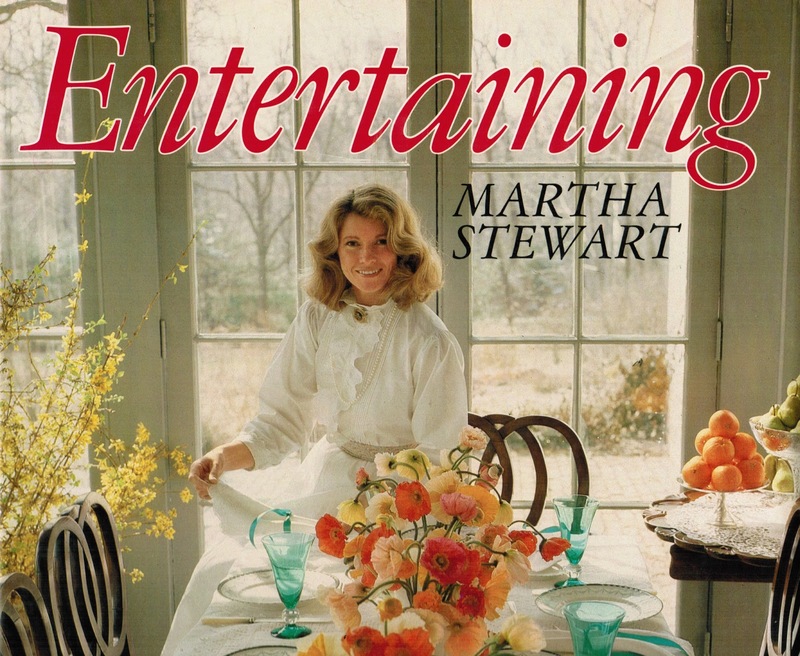 It was signed by Martha in red ink, and read "Be entertaining always Martha Stewart".